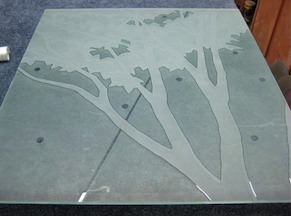 Our work, the etched and carved glass, is done primarily by sandblasting. 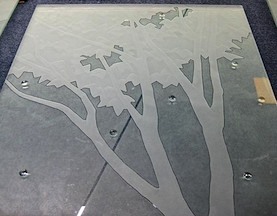 Essentially, the process involves taking a piece of plate glass, covering it with a stencil material, transferring the design, cutting the stencil and then sandblasting the exposed surface of the glass as it is revealed by peeling off the cut pieces of the stencil. It is actually more complex than that and I will go through each step in more detail. 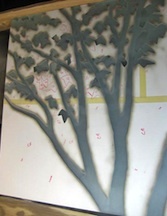 In any project, the art work comes first. I start with a design consultation during which we look at past projects, look through my design books, talk with the client to get a feel for their likes and dislikes and the environment that the work will eventually go in. I will do several compositional sketches in scale from which the client will select. Then we will talk about techniques for rendering the design in the glass. 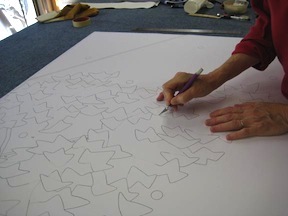 After the design has been selected and refined and the techniques decided upon, the next step is to do an enlargement at 1/3 to 1/4 scale, adding details and cleaning up the drawing. 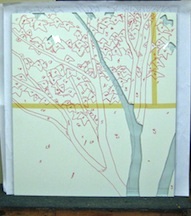 Finally, it is enlarged to full size and a new full size drawing is traced. When the drawing is complete we take it to a reprographics company and get copies made in the reverse. This is necessary because the clear smooth side is actually the viewing side so the design will have to be etched in the reverse. The first step in working on the glass is to protect the reverse side from 'back blast' and scratches while the piece is being worked on and moved around. To this end, we cover the reverse side, which is actually the front side, with a thin clear plastic tape. 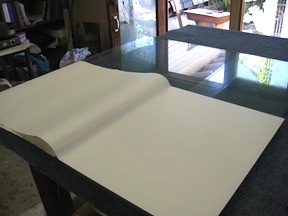 Then we flip it over and cover the worked side with the stencil material, a thick vinyl that is adhesive on one side. 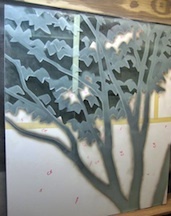 Once the glass has been covered with the stencil material, we take one of the copies of the drawing and use spray adhesive to adhere it to the vinyl covered glass. 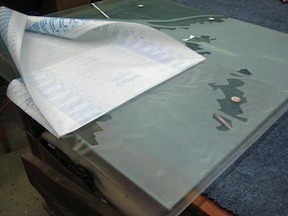 When the drawing is adhered to the vinyl covered glass, it is time to cut the stencil. For this I use a hobby knife with a #11 blade. 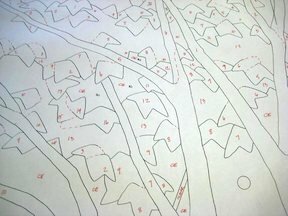 Essentially, I am tracing the design with the knife, cutting through both the paper pattern and the vinyl at the same time. The second copy of the drawing will become the diagram. 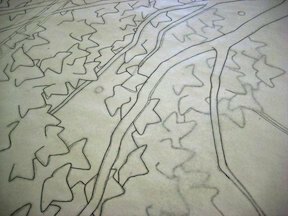 The diagram is what tells Marc, who does the actual etching and carving, the sequence for blasting, for peeling off the cut parts of the stencil. 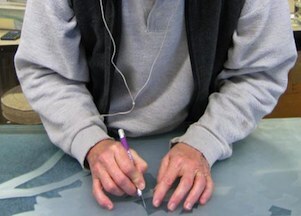 Once the stencil is cut, Marc transfers the numbering from the diagram onto the stencil for easy reference in the blast booth. 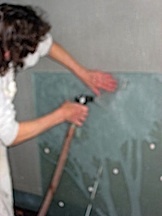 When the stencil is complete and the numbering transferred, Marc takes the panel into the blast booth. This is a small room since most of the panels we work on are too large to fit into a blast cabinet. Marc wears a separate air supplied helmet that due to the air pressure does not allow the dust to infiltrate into his breathing space. 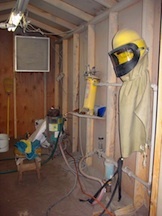 This is essential since breathing the dust can have disasterous effects on your health. He will peel off all the number ones on the stencil and carve them to the appropriate depth, then the twos, then the threes, etc until all the blasting is finished. Sometimes, privacy is required in a finished piece. When this is a requirement of the work, the next step is to clean off all the stencil material still remaining on the glass, cleaning it and then covering it again with a clear stencil material. Then I cut a new stencil around the edges of the carved and etched design staying about 1/16" away from the etching. 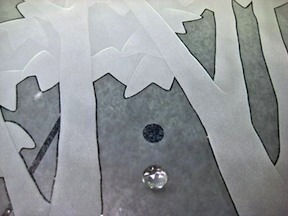 I remove the clear tape, which is now covering the etched and carved design elements, to expose the clear glass in the background. To obscure the background of the design, or in some cases, add just a different tone and texture to a design, I use a flouride salt based cream on the exposed clear glass that gives a more satin etched look. 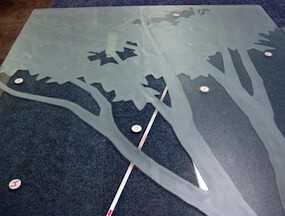 The end result is a sandblasted carved and etched design with a clear line around it and a satin opaque background. 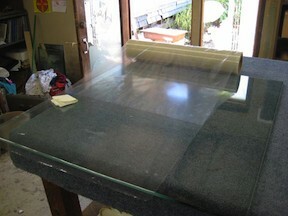 One of the other techniques we use is applying clear textured glass and bevels and jewels to the surface of the glass. This is a time consuming and complicated process that involves using a UV setting optically clear adhesive. 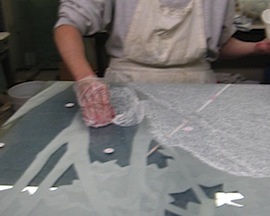 We also create different textures in the sandblasting by using glue as a resist applied in various techniques as well as blasting through open weave fabrics for certain effects. Finally, when all the etching and special techniques are done, we apply a sealer to the etched surface to help prevent dirt and oils from being absorbed by the etched surface. For more pictures and information about this installation go here.